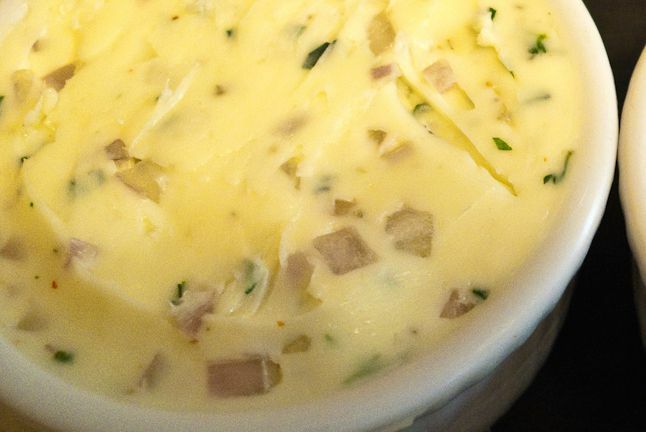 Shallot butter is a fantastic addition to steaks, fish, baked potatoes or just melting over grilled vegetables. Grilled asparagus adorned with a pat of shallot butter is especially wonderful. Typically compound butter is rolled into cylinders and chilled or even frozen, and then slices or pats are served on steaks, fish or vegetables. Peel and finely chop the shallot. You should end up with about 3 tbsp. in total. In the bowl of a stand mixer fitted with the paddle attachment, soften up the butter for a couple of minutes on low speed. Add the lemon juice and chopped shallot to the butter and continue mixing until the shallots are fully incorporated. Spread out a large (1-foot or bigger) square of plastic wrap across your work surface, then scoop the mixed butter onto the plastic. You are now going to roll the butter into a cylinder inside the plastic wrap.